To redeem this offer, simply add the 'REVITIVE Medic & Two REVITIVE Cooling Foot and Leg Gels Bundle' (RTMEBG2) to your basket and proceed through the checkout process. 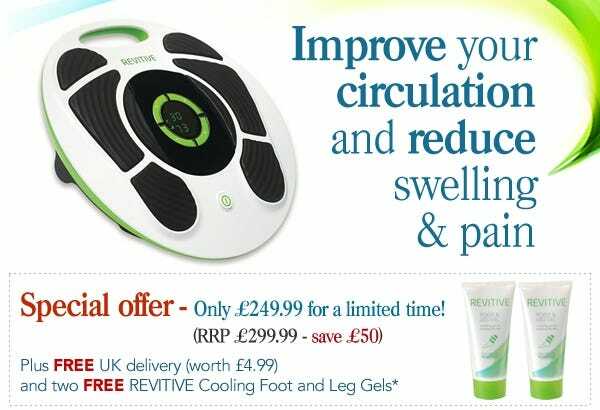 Two Cooling Foot and Leg Gels (RFLG2) and free delivery (UK standard) will be automatically applied to the order. This offer expires at 11.59pm on Tuesday 20th June 2017. No offer code is required. Cannot be used in conjunction with any other offer. Offer applies to in-stock items only. You may be eligible for VAT relief on this product. Please click here or ring 01458 447275 for details. UK orders only. We reserve the right to withdraw this offer at any time.